Tribute to the history making IICC SHOOTING STARS teammates of 1976 as written by "Daddy" Segun Odegbami. Where are they now – the history-making 1976 Shooting Stars squad? 2018 must be the ‘fastest’ year in history. It has gone like a breeze. I can’t believe it is November already. Was it not yesterday that we had the New Year celebrations, and were looking far ahead as if December is a lifetime to go? Here we are, the first midnight of 2019 already knocking on the door. Where did the whole of the year, from January till now go to? Come to think of it, was it not also ‘yesterday’ that I was a young man, freshly minted at the Polytechnic, travelling immediately after my final exams to Europe for the first time in my life, on my way to go to my first Olympics Games that summer in Montreal, Canada, as a Youth Corper? In December of that same year, I was actually also playing a very major role in the winning of Nigeria’s first continental football club trophy? In that single year, I went to the moon and back. Well, it may still seem like yesterday but the reality is that it has been 42 years since that eventful day in November of 1976, when Shooting Stars FC of Nigeria played against Tonnerre Kalala FC of Cameroon in the first leg semi-finals of the Africa Cup-Winners Cup in Ibadan and defeated the team led by the legendary Roger Miller by 4-1, to make the return leg in Yaoundé, Cameroon, a mere formality. For the first since in 40 years I spoke with the daughter of the British ‘missionary’ coach that led us in Shooting Stars FC to that sweet victory in 1976, Alan Hawkes. He has just published a book on his 6 years’ experience working with Shooting Stars FC in Nigeria in the 1970s. 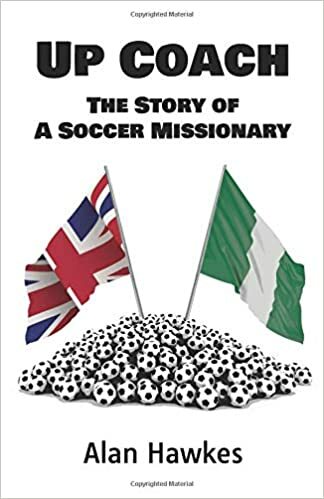 The book is released on Amazon this past week, titled, ‘Up Coach…the story of a soccer missionary’. A few weeks ago, Allan Hawkes contacted me via my Facebook page and requested to know the fate of all his ‘boys’ in Shooting Stars, players he had not had any contact within 40 years. This approximates to what I sent him. He was aware that our leader and mentor, the heart and soul of Shooting Stars, Chief Olalekan Salami had passed on. The man who hired him from England, Chief Emiola Adesina, is still alive and lives in Ibadan. Of the three Nigerian coaches that worked with him, only one is still alive – Goalkeeper trainer, Amusa Adisa. The others, Joseph Ladipo akaJossy lad and Rafiu Salami, have both passed on. Best Ogedegbe(Bestila). He kept the goal in most of the matches. He died in 2009 at 55 after working with the national junior teams of Nigeria for a few years. Joe Appiah– Ghanaian, Right-full back, died in Ibadan in May 2012 at 62. Samuel Ojebode – Captain and Left back. Played also for the national team for three years. He died in July 2012 at 68. Dauda Adepoju– Centre Half. Quiet gentlemen, but as hard as steel. Very cerebral. Uncle to Mutiu Adepoju. He died in Ibadan a long time ago. Mudashiru Babatunde Lawal(Shiru) MON, MFR – Attacking midfielder – Nigeria’s first soccer ambassador, Non-stop running, exceptionally skillful midfield player. He died in July 1991 at a very young age – 37. Folorunsho Gambari (Gambus)– Defensive Midfielder. Extremely hard and hardworking defensive midfielder, reputed for his special marking tasks, including marking out Roger Miller in 1976. He died in 1981 at a very young age of around 32. Moses Otolorin(Fantasia) – the man with the longest throws and the most powerful shots. He scored 8 of the 16 goals the entire scored in the 1976 African Club challenge. He died in December 2014 at 67. Adekunle Awesu– Died mysteriously in 1994 in the USA at the age of 43. He was named the best left winger in Africa during the 1976 Africa Cup of Nations in Dire Dawa Ethiopia. Abai Adeleye– Very quick, left winger. He died rather quietly. I am not sure of the year. The following 9 are still alive and doing relatively well. Zion Ogunfeyimi (Omo oba) – In goal. Started the competition for a few of the matches. It was an injury and Best’s incredible form that year that kept Zion a bit quiet later on and on the bench. Otherwise, he also was in the national team and in great shape. Sam Ashante– Centre Half. Ghanaian. Very Stylish and intelligent player. He now lives in Accra, Ghana. He was a coach with the MTN academy in Accra for several years. Sam Saka Abossey– Centre half. Ghanaian. Great Libero. He is married to a Nigerian woman and lives in Ghana. Idowu Otubusen (Slow Poison)– Centre Half. Intelligent, calm, cool and calculative defender. Still lives in Ibadan. Nathaniel Adewole (Commander) – Midfield general and dribbler extraordinaire. The greatest surprise is why he never played for the national team. Lives in Ibadan. He is a Rabbi and has remained unmarried all his life. Phillip Boamah(Etu) – Dashing winger. One of the few Ghanaians to play for in Nigeria’s Green Eagles. He lives with his Egba wife in Ibadan. Segun Odegbami (Mathematical) – striker.Lives mostly in Abeokuta. Attempting to become the governor of Ogun State. Kehinde Jeyifous – Defensive Midfield player. Lives in Ibadan. Segun Adelakun(Aya bi eyin) – Also nicknamed ‘Small Sheg’ by Allan Hawkes. Attacking winger. Lives in Akure; Rasaki Fadare(goalkeeper) late; Ismaila Bello(defender) lives in the US; Kafaru Alabi(late); Olaide Ali (defender) Alive. I believe he is in the USA too. Anthony Osho (attacker). There are two things mentioned by Big Sheg in this story that I think may not be accurate. Just my tuppence. The first is that I thought Kehinde Jaiyefous was a forward and not a defensive midfielder and I dam not aware that he was part of the winning team described below. Second, I have my doubt that Rasaki Fadare was part of that team. Was Fadare not at Water Corporation at that time? Where are the Sooting faithfuls? Scary part is the high number already dead. Very scary. It seems like Nigerians die mostly in their 60's . "The life expectancy in Nigeria is, unfortunately, the lowest in all of West Africa. The average life expectancy is around 54.5 years of age according to WHO data, with men living an average of 53.7 years and women living an average of 55.4 years." It’s not only Naija . Lookup life expectancies of Black men living in USA! poor environment, even for those that live in the so called choicer areas. The fumes in the air clogging lungs is horrific, then the water, etc. Yep, I am almost certain he was a forward too that missed loads of goals. I actually thought he was at Water when IICC won the cup winner's cup, same as Fadare. This is why the Chinese state that memory can easily fail us after the passage of years. Big Sheg made errors there. According to the Chinese, The Faintest Ink is Smarter than the Sharpest Brain. Agreed,in more developed nations moving to a rural town is a luxury usually for those that can afford it and in doing so they can live in a more healthy environment and still stay connected to the world outside but in Nigeria everybody clusters in the few major cities as that's what they consider to be best place to be. ...I always see the difference when I visit Nigeria. After many days in the city it was refreshing to breath better air and tranquility in the village. With self sufficiency I will reside in the village, screw the city. Only in a zoo and ediots like you are still defending it and calling it "one". The only place on earth that "one" is used as part of it's name. Silly clowns. 'furiously frank', I have never heard of Mufu Fadare in my life, not saying you are wrong though. I am certainly talking about Rasaki Fadare, the goalkeeper, and not any Mufu Fadare. Bros, I am convinced that Rasaki Fadare was not part of the IICC team that won the Cup Winners Cup as Big Sheg claims. That just isn't accurate. Rasaki Fadare and Clement Okolie were key players of Water Corporation at that time. Rasaki joined IICC later but not in the Cup Winners Cup squad. Same as Kejhinde Jaiyefous who was a much younger player. Jaiyefous was also a striker who was new at IICC, along with Siji Lagunju, in the late 1970s to early 80s (I would have to check my records to be more definitive). As much as its worth celebrating these heroes, do you realize how embarrassing it is for North African teams to have dominated these club competitions so BADLY? How many of such books will Egyptians, Moroccans and Tunisians have to write? There's this mindset of over-celebrating minnow achievements. List goes on......everything looks so BLEAK!! Stationery Stores is/was a privately owned club by the Adebajo family. There is no reason not to celebrate. Let me tell you, it is like claiming that a guy with third class honors should not celebrate graduating. You should always celebrate an accomplishment and that should not be based on some other person accomplishing more than you over a period. The Lagunjus played for Housing Corp Akure, IBL FC and later 3SC. Along with Seun Asagidigbi all in late 80s. I just dont think Rasaki Fadare played for Shooting in 70s. Heck Gambari only joined the team in early 80s.